standard File->Import DXF (dfx2a) will not. Alignment tool for aligning symbols. copying a cut box area to another location. increments using the arrow keys. routing from the top to bottom or vice versa. an unmiter feature to remove miters. vertex's, center between two objects, etc). Offsets lines and arcs by a specified distance. drc's in a single step. and text so that they may be edited easier. to an object intersection or axis. is shared with other designers. internally similar to drill chart features. outline for EMI shielding purposes. based on a center point selection. vertex snapping and dual units display option. with dimensions at the end of pads etc. with advanced object snapping capabilities. Multi feature shape check utility. OR, AND, ANDNOT and XOR shape operations. Displays and sets shape voiding priorities. editing of net connections in the PCB editor. quick and easy grid size changes. Interactively create and edit coaxial traces. Adds vias at multiple cline intersections. on different layers with vias at intersections. Inserts vias based on a text input xy file. Comprehensive symbol and net browser tool. type DFM (Design For Manufacture) checks. identification of where the changes occurred. 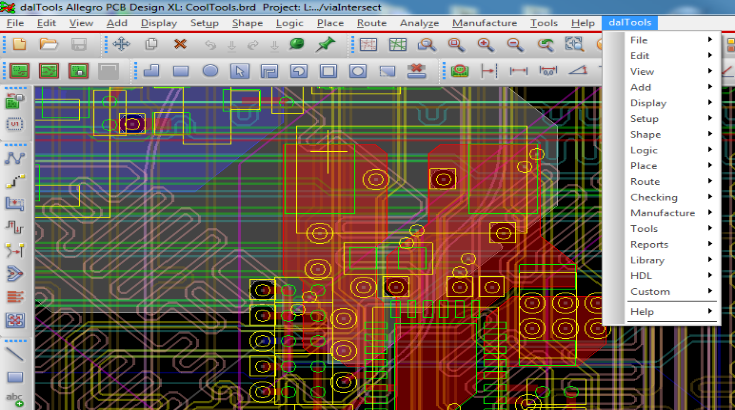 revisions or to track PCB design progress. and stacked vias supporting all types of vias. secondary non plated backdrill areas. subclass. Create details on another layer. than creating and loading plot files. require a single mouse click! Comprehensive batch PDF plotting tool. entire layers in the stackup. possible open at this point. mask caps to vias close to solderpaste pads. netname change feature, reports, etc. related statistics and data for all PCB Layouts. editing time, drcs, placed symbols, etc. symbol compare between .brd and .dra's. better than the built in align commands. option to automatically move them on grid.